I'm of mixed opinion when it comes to warrentless wiretapping. On the one hand, I like the idea of privacy. I think that privacy is what allows citizens to feel secure and free - free from discrimination, free to worship however they wish, etc., etc. The idea that telecoms would willingly assist the Bush Administration by spying on citizens sends chills down my spine. But on the other hand, I'm fully aware that the telecoms own the lines that we use to communicate. Internet service providers own the lines that we use to transmit our data. We are paying for a convenience - we're not paying for security. The notion of privacy is illusory in the first place; we blindly and ignorantly trust corporations to take our personal information from one location to the next. That said, I'm not crazy about having a president claiming that his own wartime powers trump the law and court oversight. According to McCain's camp, McCain's view on telecom immunity and warrentless wiretapping is identical to Bush's. Tragic. The conversative ideal of a limited and small government (which I appreciate) continues to erode away as we dig deeper and deeper into a state of perpetual war, which creates "justification" for unchecked presidential power. And this is all peculiar, because McCain previously stated that the president (referring to Bush) is obligated to obey and enforce laws passed by Congress in any situation. The Globe's Charlie Savage pushed further, asking, "So is that a no, in other words, federal statute trumps inherent power in that case, warrantless surveillance?" 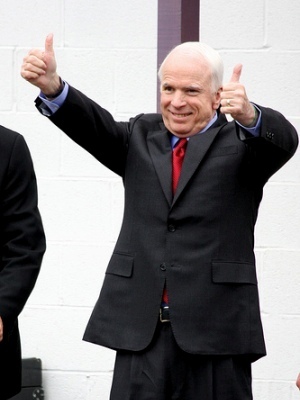 To which McCain answered, "I don't think the president has the right to disobey any law." It sure was convenient for McCain to criticize Bush's overstepping of the law prior to his own nomination by the Republican party. But now that he's closer to becoming president, I guess it sure would be handy to be able to disobey laws when it seems fit. Without goung into a battle on candidates I think your opposition to the wiretapping seems 'idealistic' but not 'realistic'. These two need to be in balance. We've infiltrated numerous terrorist plots (some with the help of Gr Britain using the same policies) and saved numerous lives as a result. By numerous I really mean thousands. When 9/11 happened our economy took a huge hit, further attacks would do the same. I think these taps have been done with a bent toward balance. They tap those who obfuscate the legal limitations of our laws. And they've gotten significant results (that typically don't get reported on major media). If they were simply tapping my grandma and family for hope's sake it would be stupid and wrong, but I don't think that's the case here. Luke - I agree that it's idealistic. That's partly why I said I was on the fence on the issue. On top of the corporations owning the lines, I also acknowledge that a government technically owns the land, and that they're the ones making and enforcing the laws... so for the government to step in and decide to listen in on phone conversations is within their power. I just don't like it. My concern is less about the government stepping in and doing that very thing, and more about a candidate saying that breaking laws set by Congress is unacceptable, and then going in and deciding that it's ok to do anyway. Hypocricy. And about the republican party talking about how it wants a limited and small government (again, I agree that it's idealistic), and yet we now have the largest government that the US has ever seen. It's the double-talk that I'm concerned about more than anything else. For a political party (and administration) to rail against "the lefties" and against dictatorships and claim to push for freedom and democracy, you'd really expect that their actions would follow suit. I mean, look at the Republican stance on illegal immigration, as though the goal is encourage protectionism and US interests. And yet Bush signed onto the NAFTA superhighway, so US jobs are going to go to Mexico, and many multi-national corporations are going to rake in the cash. Folks in the US are going to lose their jobs. Now, I'm sure you know that I don't have a problem with jobs going to countries where people don't have jobs; I'm not terribly protectionistic (although the government and associated corporations become culpable for a decrease in available US jobs, in that case). But for the conservatives to push so hard to keep Mexicans on their side of the fence, as though it's a matter of making sure US citizens have jobs grinds painfully against the administration's plan to allow US businesses to take jobs away from the US. I find the republican/neo-con agenda to be full of double-speak, propoganda, and deceit. I might actually find them alright if they just came out and said that their goal is to promote growth in large businesses by allowing greater access to cheap labor and by creating a greater import-culture in America, relying heavily on Mexico and less on China. Of course, our creating of an import-culture in relationship to China sure helped them strengthen their military. Are we sure that building an import relationship with Mexico, which shares a HUGE border with the US, is a good idea? Do we want a militarily powerful Mexico? So yeah. It's complex. I agree I'm idealistic.